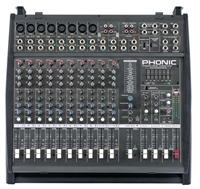 Phonic's MAX 250 Power Amplifier provides 80 Watts of power at 4 ohms (stereo) in a single rack space - ideal for smaller venues and for monitoring purposes. Phonic's MAX 500 Power Amplifier provides 120 Watts of power at 4 Ohm in a single rack space - ideal for medium-size venues and for monitoring purposes. Phonic's MAX 860 Power Amplifier provides 300 Watts of power at 4 ohms - ideal for clubs, churches, auditoriums and more.